Notes: Aintree Central was ituated on the Cheshire Lines Railway’s (CLC) North Liverpool extension line that ran from Walton to Aintree. 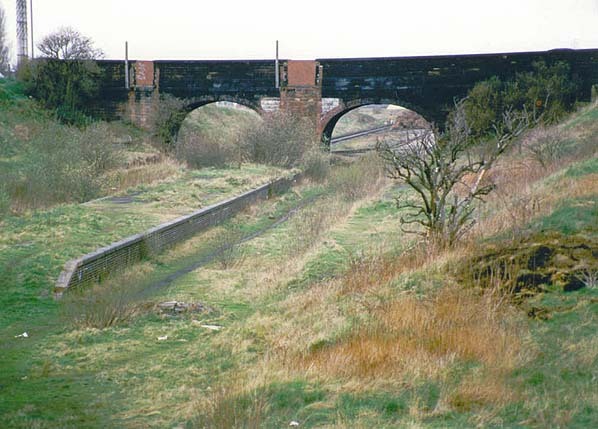 The line opened for Goods Traffic to Walton and to Aintree on the 1 December 1879. On the same date a passenger service was introduced between Walton on the Hill and Liverpool Central. The CLC was a joint railway company that was made up of three equal partners, the Great Northern Railway (GNR), the Manchester, Sheffield & Lincolnshire Railway (MSLR) and the Midland Railway (MR). line and it was used on race days only. On the 1 September 1884 the Southport and Cheshire Lines Extension Railway (S&CLER) opened between Aintree and Southport Lord Street and to coincide with the opening the station was renamed as Aintree and regular public services commenced. The new line which ran from Aintree to Southport Lord Street was designed to give access to the lucrative holiday market at Southport as an alternative to the L&Y route. From the start of public services Aintree was served by trains from Liverpool Central and from Manchester Central the former following a circuitous route that could not hope to compete with the direct Liverpool Exchange to Southport Chapel Street Route. Although the S&CLER was nominally an independent company train services were operated throughout by the CLC or its constituent companies. platforms were numbered 1 to 5. Platform 1 was on the east side of the line and was constructed from brick, it served southbound trains. Platform 1 had the main booking facilities which were housed within a single storey wooden building. Access to the platform was via a sloping ramp that led up to Park Road. Platform’s 2 and 3 were located on a brick built island platform that was at the centre of the station complex. Platform 2 served northbound trains and 3 was used by excursions. Platforms 2 and 3 had a single storey timber built canopy that included basic waiting facilities and provided passengers with protection from the elements. Toilet facilities were also provided on this platform in the form of an Iron Urinal at the south end of the platform. A small wooden shed was located at the north end of the platform which was used by ticket collectors on race days. Access to platforms 2 and 3 was by a set of steps at the north end of the island platform which connected up to Park Road. at the north end for use by ticket collectors on race days. Access was by a set of steps to Park Road at the north end. The generous provision of platforms for such a local station was due entirely to the very heavy race day traffic. In December 1895 Aintree had ten weekday services to Southport Lord Street which departed at 7.57am, 9.45am, 10.54am, 1.47pm, 2.24pm, 4.56pm, 5.53pm, 6.12pm, 7.43pm and at 8.53pm. There were also three trains to Southport on Sundays. Eight weekday services departed for Liverpool Central at 8.00am, 9.03am, 11.04am, 2.58pm, 4.31pm, 6.03pm, 7.55pm and at 10pm. There were no direct services to Liverpool Central on Sundays. To Manchester central there were two weekday trains which departed at 1.28pm and at 8.29pm. There were three trains to Manchester on Sundays. occupied by trains for most of the day. The usual working practice was for trains to be hauled out of the station as soon as they had deposited their passengers. Locomotives would go to Walton on the Hill depot for servicing whilst the coaches were made ready for the return journeys later in the day. The July 1922 timetable showed that Aintree still had ten weekday services to Southport Lord Street although the timings had altered slightly with the first departure leaving at 7.36am and the last at 9.24pm. Seven weekday services ran to Manchester Central at 8.09am, 8.44am, 10.07am, 12.49pm, 1.23pm, 6.00pm and 8.43pm. For Liverpool Central there were four trains at 8.17am, 9.18am, 3.44pm and 7.29pm. There were no Sunday services shown at this time. The line from Aintree to Southport was closed to passengers on the 1st January 1917 as a war time economy measure until the 1st April 1919. For a brief period Aintree reverted to being a terminus station but on the 1st April 1919 services resumed on the Southport line. remained as an independent company but its parent companies became the London & North Eastern Railway (LNER) who owned two thirds of the shares and the London Midland & Scottish Railway (LMS) who had the remaining third. By the 1920s the most common services ran between Manchester Central and Southport Lord Street. The LMS timetable for 18 July 1932 to 11 September 1932 showed Aintree as having nine weekday services to Southport Lord Street at 7.39am, 10.52am, 11.18am, 12.07pm, 1.05pm, 4.06pm, 5.45pm, 7.14pm and 8.10pm. There were also two Sunday trains at 11.04am and 6.43pm. Seven trains went to Manchester Central at 8.00am, 8.45am, 10.41am, 1.19pm, 1.59pm, 3.59pm and 8.38pm. There was a Liverpool Central service at 5.59pm and three trains on Sundays for Manchester Central at 10.04am, 2.34pm and 8.16pm. all passenger services from it on the 7th January 1952. Goods services followed six months later. Once again the Aintree Central station became a terminus but this time it would be for good. A sparse service operated between Aintree Central and Manchester Central which called at all stations along the route. A few peak hour services ran to Liverpool Central. Passengers wanting to travel to Liverpool Central had to change at Gatearce for most of the day. By September 1956 there were only three weekday departures from Aintree Central at 6.38am, 7.40am and 8.09am. The first two went to Manchester Central and the last to Warrington Central. There were four weekday arrivals at 2.24pm and 6.10pm from Liverpool Central, at 6.25pm from Manchester Central and at 6.44pm from Warrington Central. There were two additional arrivals on Saturdays at 1.07pm from warrington Central and 1.23pm from Manchester Central. The situation was very different on race days when trains continued to run into the station from all over the Country. On the 7th November 1960 all regular passenger services between Aintree Central and Gateacre were withdrawn. Officially the station remained open for race day traffic the last of which ran on the 26th of March 1966. 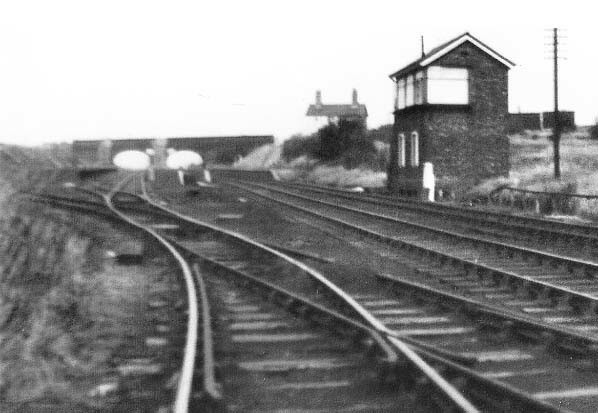 The station had closed to freight traffic on the 7th of December 1964 except for a private service that ran to the Metal Box factory which was located to the north of the station. BR (LMR) Timetable September 1956. Aintree Central Station in March 1960. A stopping service from Manchester Central had just arrived at the station. Boards can be seen at the top of the station steps. It was Grand National day and the boards provided information to passengers who were travelling on the many excursion trains that used Aintree Central . 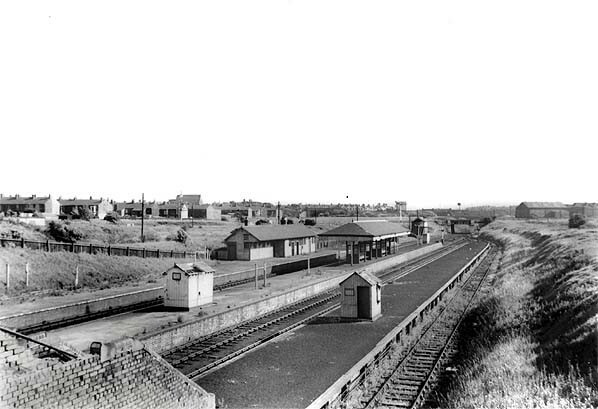 The two Aintree stations as seen in 1893. 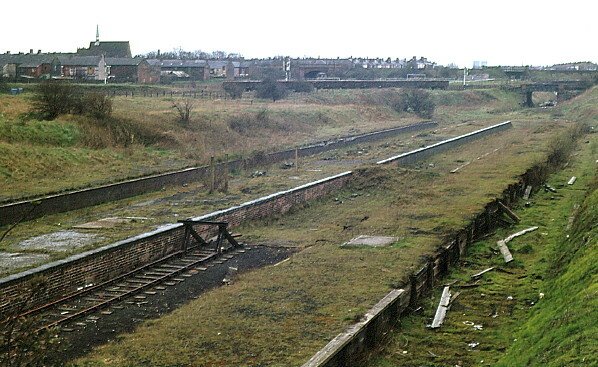 The station to the left was part of the CLC and would later be named Aintree Central. Aintree Central Station on Grand National Day 1965. 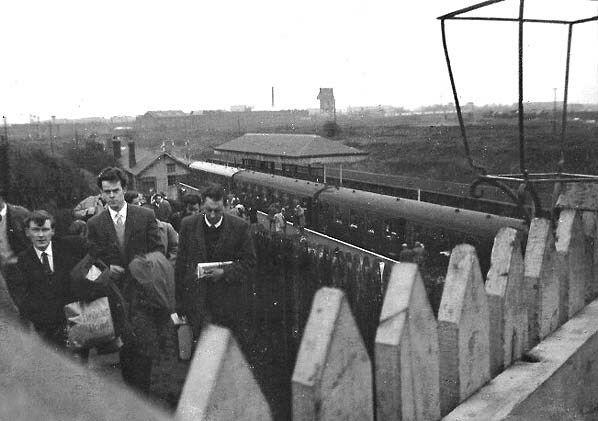 Passengers are seen leaving an excursion train and heading for Aintree Racecourse. Aintree Central after closure in June 1965. The station had been used earlier in the year for Grand National Day excusion trains. It was to be used only one more time in 1966. 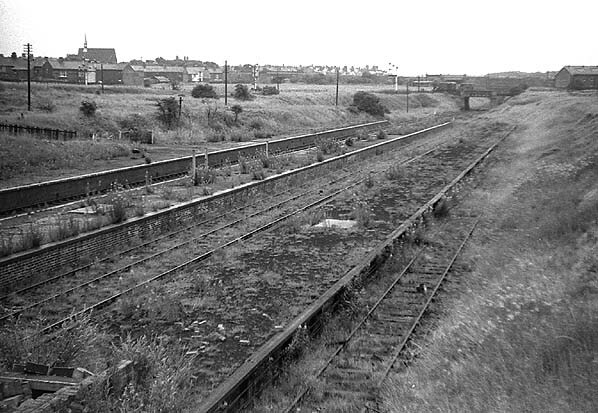 Looking north at Aintree Central station in September 1967. 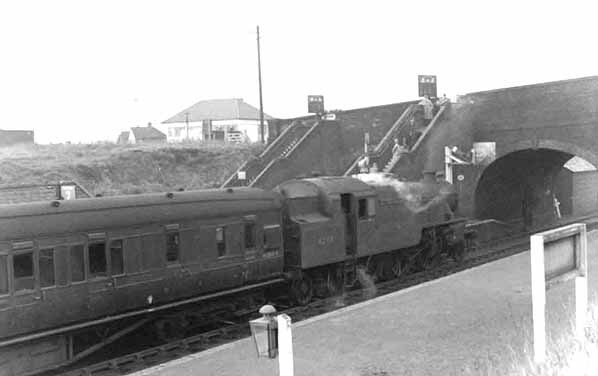 Regular passenger services had ceased in 1960 and the last Grand National excursions had run in the previous year. Aintree Central station looking south on the 4th of April 1977. The stations platforms were still intact although the timber edged excusion island platform, seen to the right was starting to fall apart. Aintree Central station looking north in the mid 1980's. 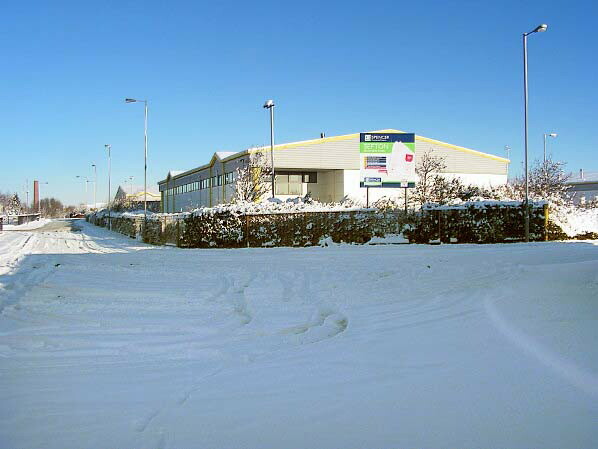 The site of Aintree Central looking north in December 2010. 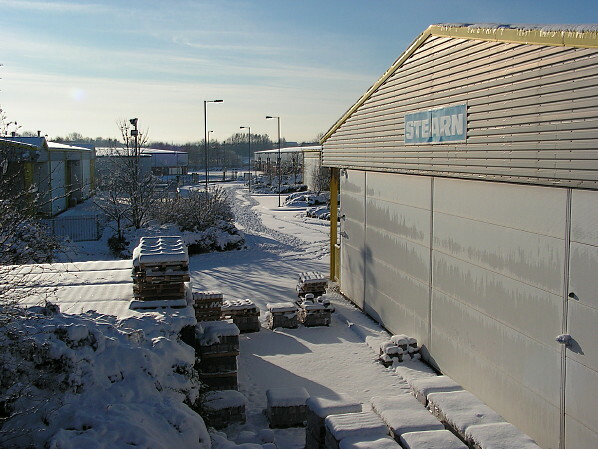 The site of Aintree Central Station looking south in December 2010. 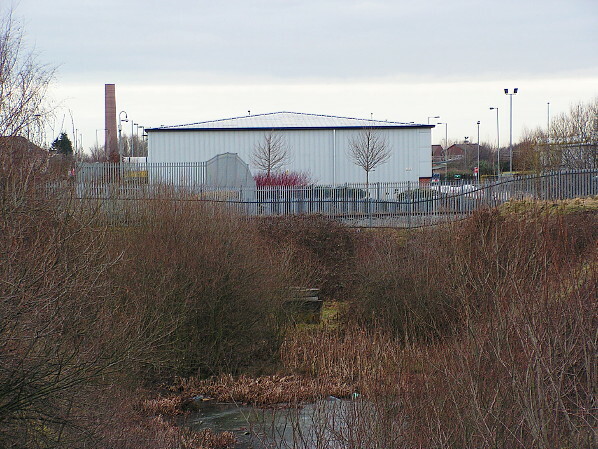 Looking north towards the site oif Aintree Central station from the embankment that carried the former LYR North Mersey Branch over the CLC line in January 2011. The flooded area in the foreground was the trackbed of the line. In the background can be seen a large grey building which occupies the site of the station.